A spectacular picture of a highway recently went viral on social media. The picture claims, it is the Mumbai-Goa National Highway NH66 that has been built by the Narendra Modi Government. मेरा देश बदल रहा है , ….! This picture has been used several times in the past. 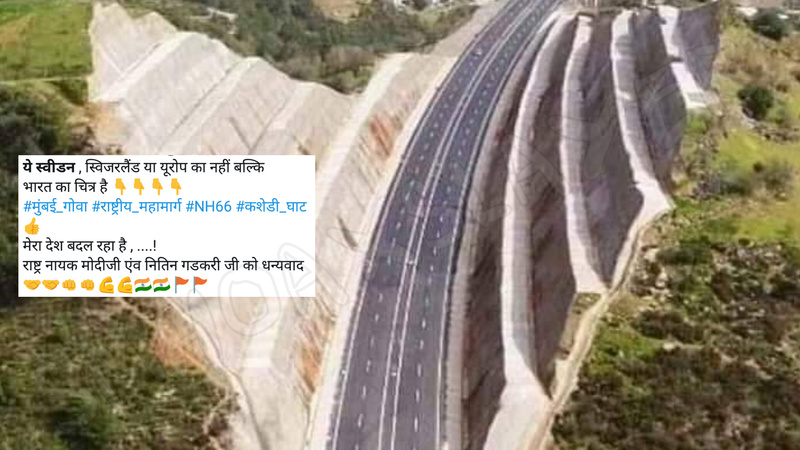 A Facebook page called “Hazara Motorway” used the picture as a highway between Pakistan and China in October, 2018. Whereas, another Facebook page “Love My Tanzania” used the picture in a different context, claiming that the highway is somewhere in Africa. The actual image is of a road called “Mersin Antalya Highways” in Turkey. A simple reverse Google Image search done by SM Hoax Slayer gave us this result. A news website called DCNepal.com used the picture in an article to talk about Turkey’s mountainous development. Here is the link of the article. Another Facebook and Instagram page of ‘Civil Engineering Discoveries’ shared the original picture in the year 2018. Other than that, several people uploaded the picture on social media which proves that it is somewhere in Turkey and not in India. 80 yılda dereye köprü yapamayanlar Ak Parti yi eleştiriyor.! ← Do you have to forward this video to get him arrested ? Did BBC report Narendra Modi as the 7th most corrupt Prime Minister ? May 11, 2018 Hoax Slayer Comments Off on Did BBC report Narendra Modi as the 7th most corrupt Prime Minister ? While the disturbing news of RSS worker Rajesh being murdered is true, a video viral claiming to be his is false. AAP’s Alka Lamba quotes a fake tweet against MP Education Minister !